Amazon Smile is a new program whereby any purchase you make via their Smile.Amazon.com website will donate .5% of the purchase price to a charity of your choosing. Right now, only physical products , not digital, are included. The problem I have is in remembering to go to Smile.Amazon.com and not just the regular Amazon.com. A solution to this is to download the “Smile Always” Extension for Chrome. It will automatically redirect you to the charitable site. There is also a Firefox addon called Amazon Smile Redirector – see the link below. Most people look forward to Veteran’s Day as a day off and fail to reflect upon it’s true purpose, to appreciate those who have served and are serving in our military. Reflecting back on my own years of service, I remember three very specific ways people showed their appreciation to me that left lasting impressions. 1. In 1991 I was attached to the USS Saratoga, a carrier participating in Desert Storm. One of my watch duties was to monitor all arriving aircraft; one, a C-2 aircraft was used to deliver personnel, supplies and most importantly, mail from the states. Mail was called “pony” (a reference to the days of the “pony express”) and I would always ask the pilot how much “pony” he was carrying. This was a very important piece of information to the crew of 5,000 who waited anxiously for a letter from home and the word that “2,000 pounds of pony” had arrived would spread like wild-fire throughout the ship. The mail for the Operations Department came through my office and my Yeoman was responsible for distributing it to the various Divisions and Branches. The sailors would line up at mail-call and respond excitedly when their name was called. Many of them were disappointed when there was no mail for them. That prompted me to write a “Letter to the Editor” of a couple dozen major newspapers and ask their readers to write a letter or send a “Care Package” addressed to “Any Sailor USS SARATOGA”. Well the response was overwhelming and soon we had enough mail so no one was left out of mail-call. When you’ve been at sea for 8 months, working 7 days a week, 18+ hours a day, there’s something very special about getting a letter and hearing how much the folks back home appreciate you. 2. After Desert Storm, we returned home to a hero’s welcome, 10,000 people lining the docks and streets of Mayport, Florida. My family was waiting for me on the pier as the speakers played the “God Bless the USA” and other patriotic songs. Driving home through the streets lined with banners and cheering strangers I lost control and wept. I wish every returning service member could have such a public show of support upon their return. If you ever get the opportunity to attend a public show of appreciation to our vets, especially as they return from their tour of duty, do it. 3. This last one only happened to me once in my career, but it was one of the most memorable events of my life. I was on a commercial flight into San Antonio Texas and was in my uniform. As I walked through the airport an elderly man approached me, reached out his hand and shook mine saying, “I really appreciate your service to our country. Thank you.” We talked a bit and it turned out he was a World War II Vet. We sat and swapped a few war stories then parted. As I walked away, I realized that nobody had ever done that before to me; a total stranger walking up, shaking my hand and saying thank you. It moved me so much that 20 years later, I still go out of my way to shake the hands of men or women in uniform. You may not think it means much, but to those who serve, it means the world. William James once wrote “The deepest human need is the need to be appreciated.” This Veteran’s Day take the time to write a letter to a sailor, send a care package to a soldier, attend a Veteran’s Day rally or just shake a Vet’s hand and say a sincere “thank you”. It will make their day….and yours too! Tom and Gerry’s terrific friends divided into two teams – The Orange Navels and the Mean Green Fighting Machine in a Charity Game Show Battle. While the Orange Navels won the tie-breaking question, the real winner was Habitat for Humanity. Friends raised $700.00 for the charity and everyone had a great time in the process. With the help of Bev, I created a Game Show in Power Point that is easy to use and worked well. If anyone wants a copy for a charity event, I’d be glad to share it with you. – As people come in, I divide them into two groups – Orange or Green. – The team captain is assigned ahead of time – you want someone who is a bit of an extrovert and who can take charge. – We played for almost two hours. I’d recommend three possible rounds. The first team to 300 points wins the first round. The same with the second round. If you need a 3rd round, just have a tie-breaker question. – We are very lenient on answers. – Green and Orange Balloons worked well. – Have the teams come up with a name, a poster board with the name, a cheer and a charity. – In the two hours we got through seventeen questions. – A microphone does help. – You need a scorer with a flip chart. – Go over the rules slowly – especially about ringing the bell and the question. On one of Oprahs’s shows, she had Peter Walsh go to people’s apartments and homes and help them get rid of the clutter and mess. One of his tips was to turn all your clothes hangers backward. When you wore a piece of clothing, you could turn it around to the normal position. 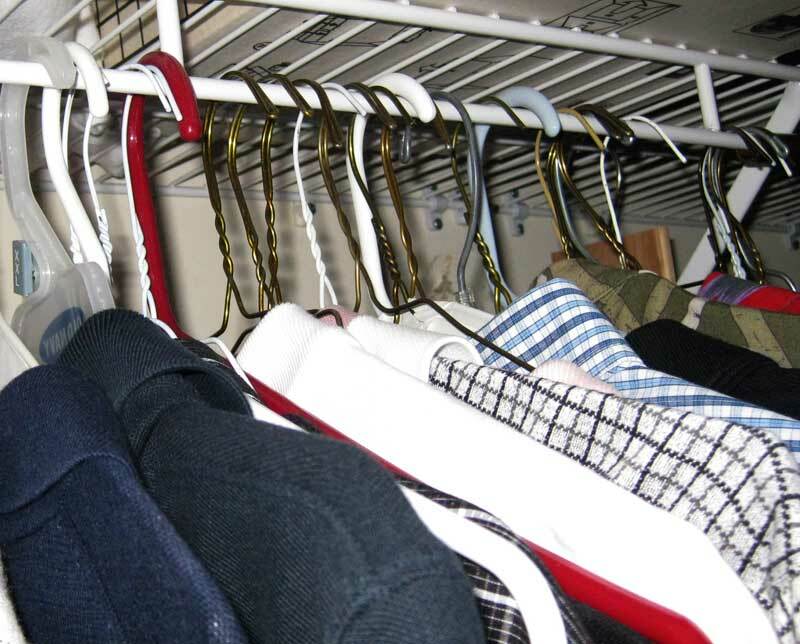 At the end of 12 months, those clothes which are still turned backwards in the closet haven’t been worn and should be donated to a charity of your choice. A friend of mine, Mousa Braik, has recently lost his job as a result of a plant closing. He is multi-talented, hard working and has a great spirit. Please visit his website for his resume if you know of any job openings in the St.Louis area.